Jim's bowls and style of woodturning are deeply tied to his Scandinavian heritage. 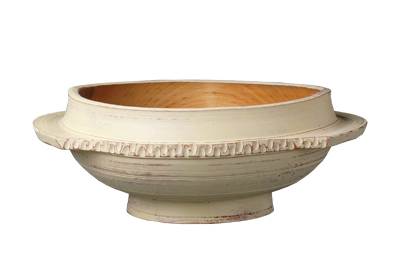 In discovering the craft of his ancestors, Jim studied with Willie Sundqvist, learning traditional carving techniques, studying historic wooden bowls and learning the use of hook tools for green woodturning. His passion for Scandinavian-inspired turnings came out in the form of traditional ale bowls ranging from simple, everyday bowls to the avant garde bowls used for celebrations. He turns wood green. When the bowls come off the lathe they are complete and over the next few days they go through a dance. "The side grain goes down, the end grain comes up, and the body turns oval creating an elegant sweeping rim. Working with wood in this way, the wood and I have something to say as to its final form. Once that dance is done, I work the bowl on my lap or on a shave horse. I hold the bowl while using a Sloyd knife to carve off part of the wide ring, which creates handles on the bowl" he tells us. In his words, Jim's bowls are organic; showing the marks of the tools he uses adds visual character and a tactile element in the same way a potter leaves the tracks of his fingers on his pots or a painter the brush strokes on a canvas. If the bowl cracks then he creates a patch out of sheet metal or makes staples out of brass or copper to create a type of suture to hold the bowl together. Because his bowls are functional, whatever finish Jim puts on his vessels also goes in his body. On the outside of the bowl he makes his own milk-based paint, which contains natural pigments and he then coats the whole bowl with linseed oil.